Are you looking for added protection and ultimate convenience for your beloved bike? All-weather maximum protection is yours with this hexagonal PVC-covered Bike U-Lock featuring 3 keys (one with LED light, one with key-replacement code card), combined with a steel cable for maximum flexibility whatever your locking needs. Mounting bracket included provides easy storage wherever you go. DURABLE ALL-WEATHER PROTECTION - Hexagonal PVC cover resists corrosion from water, dust and dirt to prolong the life of your lock. All-weather performance means peace of mind and better security! EASY TO LOCK - Lock and go! Locking your bike is fast and easy with our quick, no-hassle system. CONVENIENT SECURITY - 3 keys for convenience! Lost your keys? No problem! 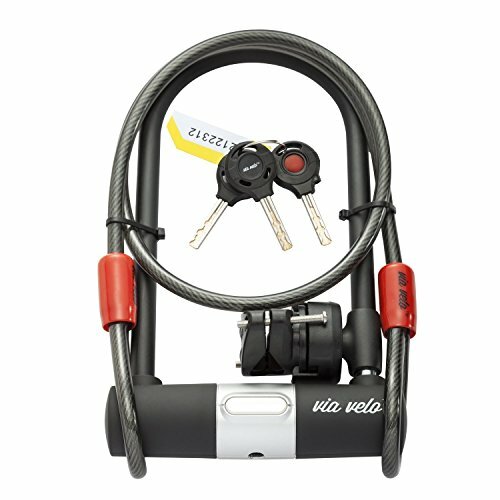 Via Velo can replace your keys with the code from the included code card. NIGHT-TIME SAFETY - Unlocking in the dark is easy with the LED-lit multifunction key! SIMPLE STORAGE - Convenient high-quality mounting bracket means your lock goes with you, no extra packing required. Fits 20-42mm bike tube. NON-SLIP PAD - Keep your lock in place! Our bike lock mounting pad maximizes safety and convenience while you cycle. DESIGN & PERFORMANCE - High-quality steel cable allows greater locking flexibility. Smoke grey transparent cable cover adds a modern stylish touch.